In the first month since substantial federal depreciation allowances on business trucks expired at year end, fleet sales plunged 14 percent at Ford Motor, 18 percent at General Motors and 45 percent at Toyota. Frigid weather and weak fleet sales held January U.S. auto sales 3 percent below brisk year-ago volume. 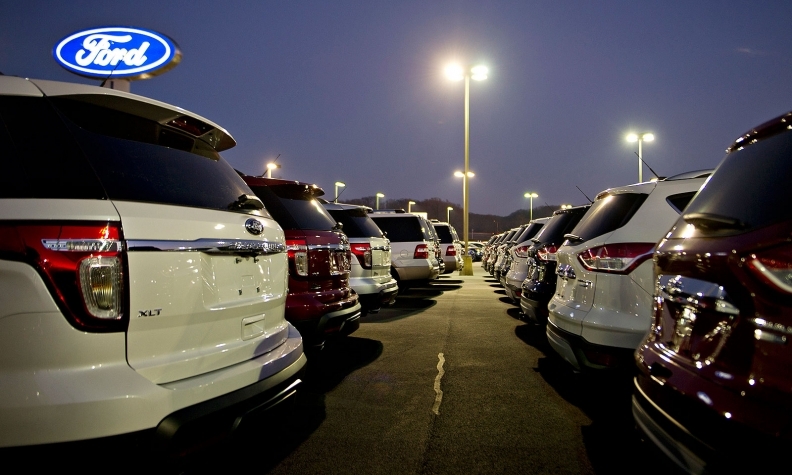 Automakers and dealers sold 1,011,187 light vehicles for the month. The seasonally adjusted annual selling rate was 15.2 million, virtually unchanged from last January, but down slightly from December's 15.4 million SAAR. "Record low temperatures and heavy snowfall had an impact on some parts of the country," Toyota Division General Manager Bill Fay said in a conference call. Toyota gains in the West and South "couldn't offset losses in the Midwest and East Coast, areas hardest hit by the storms." As a result, Toyota Motor Sales' volume fell 7 percent for the month. Ford sales boss John Felice did not cite Section 179 depreciation as a factor, but he noted that factory closings caused by bad weather kept the automaker from filling some fleet orders in January. Fay said Toyota is on "expected" pace with fleet sales this year and a year ago was completing makeup fleet shipments. Among the major players, January results were mixed. Nissan North America led the pack, up 12 percent. Chrysler Group volume jumped 8 percent as the Jeep brand soared 38 percent. Hyundai-Kia eked out a 1 percent increase. American Honda was down 2 percent, but ahead of the industry's overall 3 percent decline. But the rest of the large automakers lost substantial ground to start the year. In addition to Toyota's decline, Ford Motor fell 8 percent and GM sales dropped 12 percent as every brand except Buick recorded double-digit declines. Toyota, Ford and GM also are handicapped in sales comparisons because the trio led last January's 14 percent overall sales charge, each recording increases between 16 and 27 percent. Volkswagen Group of America was down 13 percent overall in January, its sixth straight monthly decline. Again, the primary cause was Volkswagen Division sales plunging; this time, 19 percent for the month. "VW's in a tough spot in almost every segment," said analyst Alec Gutierrez of Kelley Blue Book. "Its high average transaction prices make for a high cost of entry, its models are relatively old and it isn't well represented in the two hottest segments -- no pickups and only the Tiguan in small crossovers." Among the smaller players, Subaru led the way with a 19 percent gain. Jaguar Land Rover was close behind, up 15 percent, 11 percent for Land Rover and Jaguar 31 percent higher. Mitsubishi rose 5 percent. BMW Group rose 3 percent overall, with the BMW brand 11 percent higher and Mini down 31 percent. Daimler AG gained 2 percent, with Smart’s 8 percent gain leading a 1 percent increase for Mercedes-Benz. But Volvo volume fell 22 percent. Mazda sales dropped 12 percent, its fourth straight monthly decline. After huge gains over the past two years, January sales of full-sized pickups declined 3 percent to 120,428 units to match the overall light vehicle market. Two models were hot sellers: sales of the Chrysler Ram pickup jumped 22 percent to 25,071 and the Toyota Tundra rising 13 percent to 7,890. But that couldn’t offset plunging volume for GM’s twin pickups, the Chevrolet Silverado and GMC Sierra, which were down a combined 17 percent to 40,044. Ford’s best-seller, the F series, was down 1 percent to 46,536. Sales of the aging Nissan Titan keep falling, off 36 percent to 887 units. Ford sales boss John Felice blamed a combination of factors for the segment’s poor performance. “The full-size pickup truck segment was down, largely as a result of year-over-year pull-back, overall incentive [spending] and again, the poor weather in the central part of the country,” he said. With a 29 percent gain from a year ago, the Fiat brand outsold the BMW group’s Mini. Fiat sold 3,222 units in January compared to 2,543 for Mini, which was down 31 percent.